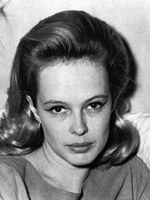 Sandy Dennis worked in stage and film actress. She won the 1966 Academy Award for Best Supporting Actress in Who's Afraid of Virginia Woolf? 07/14/1975 0308 Snake in the Grass After discovering a new kind of clover, a female scientist magnanimously allows her colleague to take credit for the find. When he turns up dead, all evidence point to her. When she is accused of his murder, a smitten detective works to prove her innocence. I am an enormous fan of the late Sandy Dennis. However, she belonged in front of the camera. She was a MOVIE STAR. In Snake In The Grass, the poor woman was nervous, sounded as if she were reading through the entire script, and failed to give a good performance. However, I will sit and watch any film she ever made. She was great on film. I loved Sandy Dennis. She was always so weird. Her voice was the greatest! I can see how it might sound like she was nervous and stilted in this genre, but I took it another way. As a scientist, she is a concrete thinker and in control of her environment Her character WAS nervous and she may have played it choppy as she tried to process what was happening to her like working through a lab check off. Her monotone at times voice may have reflected attitude over having to defend her dignity at someone not always trusting someone as esteemed as she felt she should be. Sandra Dale “Sandy” Dennis (April 27, 1937 – March 2, 1992) was an American theater and film actress. At the height of her career in the 1960s, she won two Tony Awards, as well as an Oscar for her performance in Who's Afraid of Virginia Woolf?. Dennis made her television debut in 1956 in The Guiding Light. (1956) Her first feature film, Splendor in the Grass (1961), other film appearances includes Up the Down Staircase (1967), The Fox (1967), Sweet November (1968), The Out-of-Towners (1970), and others. On Broadway she appeared in A Thousand Clowns (1962–63), Any Wednesday (1964-66), The Three Sisters (1966) Daphne in Cottage D (1967), How the Other Half Loves (1971), Absurd Person Singular (1974-76) and others She guest-starred on episodes of the TV series Naked City, The Fugutive, Arrest, and Trial, and Mr. Broadway, Only Way Out Is Dead, the Love Boat, Alfred Hitchcock Presents, The Equalizer and others.